My husband really wanted to have quesadillas for the Super Bowl this year. 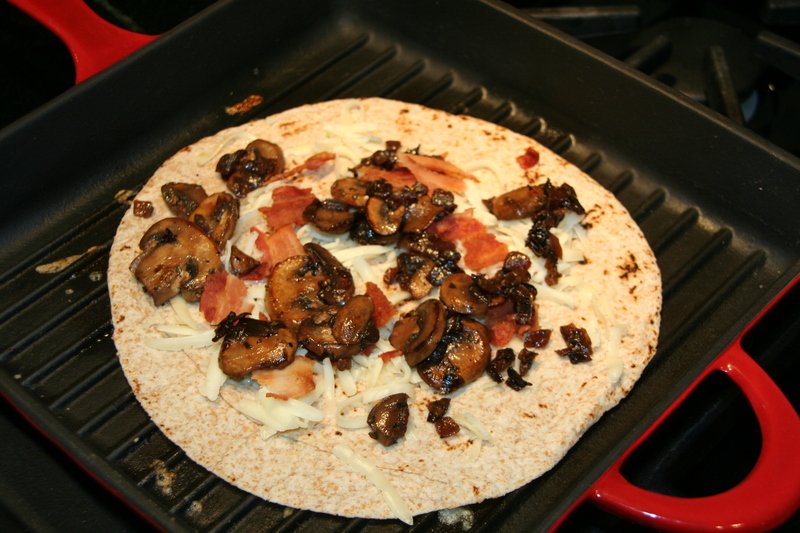 My daughter had a plain cheese quesadilla, and the rest of us had mushroom and red onion- with bacon. I used a mixture of pepper jack and Monterey Jack cheeses, and made them on whole wheat handmade tortillas from Trader Joe’s (my favorite). I have great success cooking them on our cast iron panini press, preheated on low, and I served them with brown basmati rice, refried beans, and avocado slices. This recipe is from Martha Stewart Living- I just added the bacon (optional). Heat a sauté pan over medium-low heat; add olive oil. When hot, add onion; sauté until translucent, about 5 minutes. Add mushrooms and epazote; cook until mushrooms are tender and most of the liquid has evaporated, about 5 minutes. Add lemon juice, season with salt and pepper. Pair with queso fresco, Monterey Jack, and guacamole.